Sometimes the immune system perceives a threat and reacts in a variety of ways. A respiratory or lung allergy causes symptoms directly reflected in how a person breathes. Pollen, a major trigger for asthmatics, stimulates white blood cells to release a substance called histamine. This irritating substance produces a stuffy nose and itchy, watery eyes. In people with asthma, histamine can also cause a list of additional allergy symptoms, which usually occur soon after exposure. Examples of airborne allergens that cause respiratory allergy symptoms include pollens, animal dander, dust mites, and mold spores. Breathlessness is the sensation of not getting enough air, often accompanied by a sensation of tightness in the chest. A narrowing or blockage of the airway due to an allergic reaction causes this affect. As the inflamed or blocked airway prevents a person from taking a deep breath, the person takes more and more short, shallow breaths, which can lead to a drop in oxygen and an increase in carbon dioxide in the body. A feeling of breathlessness occurs as the brain, muscles and other body systems become oxygen deprived. Wheezing is a whistling sound produced by breathing through a narrowed airway. 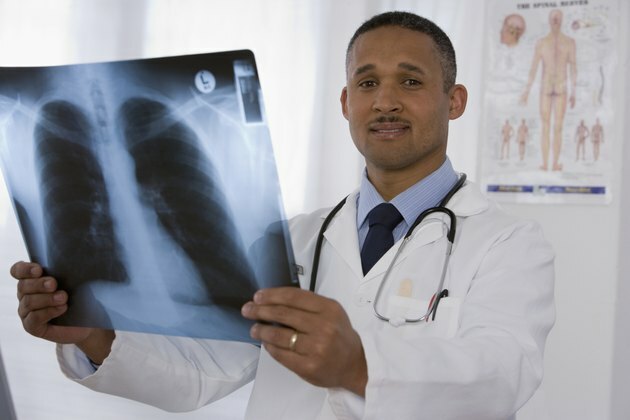 Generally, wheezing can only be heard through a stethoscope. However, when allergy symptoms become severe as a person struggles to catch their breath, it can be heard by the human ear. Wheezing upon exhalation is more prevalent, but it can also occur when inhaling. According to the American Academy of Allergy Asthma & Immunology, when the smaller bronchial tubes within the lungs become narrow, it can cause chest discomfort, a sensation of pressure or constriction in front of the chest. When the larger airway narrows because of inflammation, it also becomes difficult to breathe causing audible wheezing. Coughing is a beneficial and protective reflex that clears irritants from the trachea and bronchi or airway of the lung. The cough reflex receives messages from receptors in the airway that are sensitive to stimulation by inhaled particles such as pollen. The messages travel to a center in the brain stem, which triggers the cough. The coughing mechanism clears the mucus, fluid and allergens that settle in the upper and lower airway. According to the Centers for Disease Control and Prevention, coughing is the most common reason why people seek medical attention. A classic sign of respiratory symptoms due to allergy is inflammation of the airway. The inflammation causes swelling and increased mucus production, which can result in wheezing, breathlessness, coughing and chest tightness. According to the National Heart Lung and Blood Institute, research has shown there is a genetic component that controls the inflammatory response to specific allergens. This response causes an allergic reaction, which in turn causes airway inflammation.